Takeaway: Always work with a professional to develop an effective corporate warm-up routine. Few jobs require as much physical labor as those in the construction industry. With such physicality comes an increased risk of injuries, many of which are musculoskeletal in nature. Musculoskeletal injuries cost employers and employees in many ways, including medical treatment, time off the job, and training of replacements—all of which, along with related costs, result in a loss of several million dollars annually. In fact, injuries sustained in the construction industry tend to be twice as costly and result in more time off the job than those suffered by workers in other industries. Musculoskeletal injuries include sprains and strains, overexertion, soft tissue injuries, and repetitive strain injuries. Back and spine – The overall rate of neck and back injuries has seen a consistent decline from 34,000 injuries in 2002 to 12,000 injuries in 2010 but the construction industry still sees more back injuries than most other industries (almost 25 per 10,000 workers, as opposed to 21 for all other industries combined). Hand and wrist – Almost 10% of non-fatal, construction-related injuries suffered are injuries to the hand and wrist. Knees – Approximately 9% of injuries in the construction industry are knees-related. Neck and shoulders – Injuries to the neck and shoulders account for close to 8% of all reported injuries in the construction industry. Over the years, those tasked with ensuring on-the-job safety have become increasingly aware of the importance of smart, safe lifting techniques and proper body mechanics as ways to mitigate workplace hazards (check out these Top 10 Lifting Rules to learn how to life safely). Despite improvements to training in proper lifting and education on safe posture, too many construction workers are still experiencing musculoskeletal injuries. In order to further decrease these instances of injury, it is time to look at other options and opportunities to help employees work safely. Imagine if a professional athlete hopped out of their car, went right onto the field or court, and immediately started playing a competitive match. Despite their countless hours of training, jumping straight into strenuous movements without a proper warm-up would almost certainly result in an injury. Athletes understand the need to work their muscles out, to warm them up, and to stretch those areas that are sore or tight. They spend a significant amount of time ensuring their bodies are primed and ready to perform the physical tasks they are about to undertake. This preparation for the game not only allows them to play at their peak level, it also helps them prevent injury and recover more quickly before putting their body to work again. Like professional athletes, construction workers rely on their bodies daily to function on the job. It only makes sense that these workers should take similar precautions to adequately prepare their bodies for physical tasks and to ward off injury. Taking the time to go through well-designed, prescribed movements before launching into daily construction work tasks could result in tangible benefits and reduce potentially high compensation and lost time injury costs (learn about Calculating Your Company's Lost Time Injury Frequency Rate). One such program, created by physiotherapists and conducted by an on-site trainer, involves construction workers regularly performing a set of stretches before work, resulting in increased flexibility and back endurance. A review of this and other workplace stretching programs showed additional favorable results, such as diminished chronic pain. Warm-up programs, along with stretching and flexibility sessions, are finding their place in more workplaces and employees are becoming increasingly vocal about the benefits. Articles detailing the results and reception of these programs are being shared throughout the business community. Case in point, a ten-minute exercise routine was shared by a group of 70 construction workers in Austin, Texas, and has since made headlines and been shared multiple times since December. Find a professional. You’re not likely to entrust your financial documents to somebody with no history of accounting or bookkeeping. Likewise, you’re not likely to see effective injury prevention if you leave your physical warm-up program in the hands of an inexperienced person. It is important to build your program with the help of a professional trainer, physiotherapist, or coach who understands the work your team is doing. Physiotherapists make their living by understanding how the body works, how muscles and joints move, and how to work through injuries. Working with an experienced professional in these areas will yield the best results for your workers. Customize. Every aspect of construction work has its own issues and puts stress on different parts of the body. It’s important to fine tune the exercises to the specific movements your team will be performing. If you see a lot of shoulder injuries but not as many knee injuries, then working on the knees is probably not going to yield as much of a payoff than by focusing on the neck, shoulders, and upper back. Make sure your professional trainer understands what your team’s activities look like and what the biggest challenges are. Commit. Like any other change, adding a stretching or work-out program can be met with resistance, ranging from skepticism to outright refusal. It’s important to get everybody on board and make this a positive change. Outline the benefits for everyone who participates and encourage them to think of this as a short-term change with a long-term payoff. Explain to them that this new regimen is similar to starting any other exercise program where the first few weeks are the hardest but will eventually become a habit that improves mental and physical health. Monitor results. It’s going to take more than monitoring OSHA 300 Logs for injuries. Techniques may appear to be working in the logs (decrease in injuries) but if your employee satisfaction has decreased then something may need to change. Taking into account both objective and subjective results from your team will allow you to fully understand how your new program is being received and implemented. Be flexible. No pun intended. Know from the onset that your program may need to be tweaked in order to achieve optimal results. Be willing to shift things to accommodate employee feedback and changes in job duties. Construction teams are finding success with professionally built programs tailored to their specific tasks, with some seeing as much as a 67% decrease in lost work days due to work-related injuries. It’s tough to argue with these numbers. Keep in mind that the benefits of a warm-up or stretching program will not emerge overnight. This is a long-term commitment that yields results over months and even years as opposed to days or weeks. Small daily deposits of time and effort contribute to significant benefits over time, for individual workers and the company as a whole. 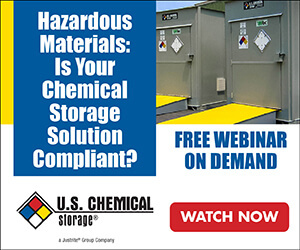 Free Webinar On Demand - Hazardous Materials: Is Your Chemical Storage Solution Compliant? Improper storage and handling of flammable liquids is the leading cause of industrial fires. The challenge with hazardous materials, whether corrosive, flammable, or combustible, is that they can’t just be stored anywhere.